Bath Guitar Festival (19-25 July 2013) celebrates 20 years of wonderful guitar events around the city. 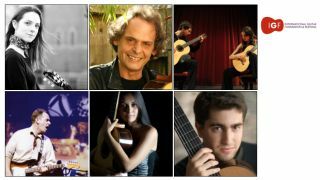 The guitar is unique in its appeal to people of all ages, musical tastes and economic means; no instrument is as accessible and versatile as the guitar, come and be thrilled by our concerts in every style. In classical we celebrate Julian Bream's 80th birthday and Benjamin Britten's centenary with performances and a new commission by Errollyn Wallen. The programme this year features performances from performers as diverse as guitarist-composer Roland Dyens, VIDA Guitar Quartet (with Dance), funk and groove band The Bad Hands, The Fingerstyle Collective, brilliant British classical guitarist Graham Anthony Devine, French virtuoso Philippe Villa, singer-songwriter and producer Jay Stapley, the astonishing young Spanish guitarist Rafael Aguirre, Guitar Techniques Presents: Stuart Ryan, Jason Sidwell & Neville Marten, student concert with the Night of 1000 guitars series and the exciting young guitarists Michael Butten, Laura Snowden, Isabel Martinez and Tom Ellis & Laura Snowden Duo are featured in the Young Artist Platform. But don't stop there: bring your guitar to our classes in Europe's premier summer school, with courses including Blues with Gianluca Corona, Classical with Amanda Cook, Julian Masters, Graham Anthony Devine & IGF's Artist Director Tom Kerstens, Fingerstyle with Stuart Ryan, Groove Empowerment with Jason Sidwell, Jazz with Dario Cortese, Neville Marten's Song Surgery and a course for singer-songwriters with Jay Stapley. The guitar is the most popular instrument in the world and is celebrated in its mesmerising variety at this festival: from living folk traditions to thrilling notated compositions: from acoustic historical instruments to the cigar-box guitar. This Bath Guitar Festival seeks to promote the range of guitar culture for everyone. Future subscribers also get 25% off gig tickets at Bath Guitar Festival. Email bathguitarfestival@futurenet.com and quote your subscriber number to claim your discount code. Visit the official Bath Guitar Festival website for the full 2013 programme of events.